A researcher from the Queensland University of Technology's is hoping to unlock the potential of mesenchymal stem cells as a way of repairing neural damage to the brain. 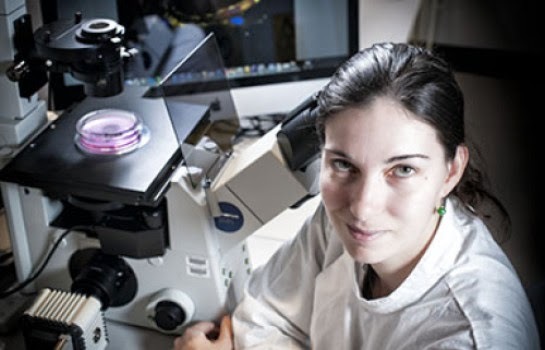 Rachel Okolicsanyi, from the Genomics Research Centre at QUT's Institute of Health and Biomedical Innovation, said unlike other cells in the body which were able to divide and replicate, once most types of brain cells died, the damage was deemed irreversible. Ms Okolicsanyi is manipulating mesenchymal stem cells from bone marrow to produce a population of cells that can be used to treat brain damage. "My research is a step in proving that stem cells taken from the bone marrow can be manipulated into neural cells, or precursor cells that have the potential to replace, repair or treat brain damage." she said. Ms Okolicsanyi's research has been published in Developmental Biology journal, and outlines the potential stem cells have for brain damage repair. "What I am looking at is whether or not stem cells from the bone marrow have the potential to differentiate or mature into neural cells. Neural cells are those cells from the brain that make everything from the structure of the brain itself, to all the connections that make movement, voice, hearing and sight possible." she said. Ms Okolicsanyi's research is looking at heparin sulfate proteoglycans -- a family of proteins found on the surface of all cells. "What we are hoping is that by manipulating this particular family of proteins we can encourage the stem cells to show a higher percentage of neural markers indicating that they could mature into neural cells rather than what they would normally do, which is form into bone, cartilage and fat. We will manipulate these cells by modifying the surrounding environment. For example we will add chemicals such as complex salts and other commonly found biological chemicals to feed these cells and this will either inhibit or encourage cellular processes."" she said. Ms Okolicsanyi said by doing this, it would be possible to see the different reactions stem cells had to particular chemicals and find out whether these chemicals could increase or decrease the neural markers in the cells. "The proteins that we are interested in are almost like a tree. They have a core protein that is attached to the cell surface and they have these heparin sulfate chains that branch off. So when the chemicals we add influence the stem cell in different ways, it will help us understand the interactions between proteins and the resulting changes in the cell. In the short-term it is proof that simple manipulations can influence the stem cell and in the long-term it is about the possibility of increasing the neural potential of these stem cells." she said. Ms Okolicsanyi said the big picture plan was to be able to introduce stem cells into the brain that would be able to be manipulated to repair damaged brain cells. "The idea, for example, is that in stroke patients where the patient loses movement, speech or control of one side of their face because the brain's electrical current is impaired, that these stem cells will be able to be introduced and help the electrical current reconnect by bypassing the damaged cells." she concluded.